Mageplaza Gift Card extension has gradually demonstrated its position in making the success of any companies when they want to focus on gift certificates as strategic products. Beside its flexibility in creating a personalized voucher, this extension also offers customers different ways to keep their gift cards either physical or digital or both of them. In general, there are four delivery methods offered to shop admins to apply for stores. However, depending on different purposes and features of businesses, store owners can decide to use one, some, or all these delivery methods. For example, if store admins do not turn on SMS notification, customers can not send their gift cards to recipients via text message. It is the same to other delivery methods. In this case, provided that those four ways are applied to send a gift card, it can be exist in two types: digital and physical certificate. To enable customers keep e-certificates, shop admins have to turn on SMS notification and Email notification in backend. To be more specific, they need to navigate Admin Panel > Store > Gift Card > Configuration. On the display page, admins have to access Email Notification and SMS Notification and enable these functions by selecting Yes in the field box. Along with e-certificates, cards’ owners can receive updated reminders via SMS or email address about their cards’ status such as changes in balance, expired date, and so on. When shop admins turn on functions Print At Home and Post Office, customers can treat their gift cards as physical vouchers and keep them handy to use at any time. If in the backend, shop admins enable Email and SMS Notification, in the frontend, customers can select these delivery methods to get their e-vouchers. No matter which way is chosen, buyers have to provide required information to successfully complete the deal. If they want to send their certificates via SMS, it is of utmost importance to fill in recipient number. Similarly, if email is chosen, customers can not forget to provide recipient email. After completing all required information, a message or an email will be sent to recipient address as sender provided. Depending on personal preferences, some people would love to obtain or to present other people a physical gift card. Therefore, when placing an order, buyers have to choose Print At Home if they want to purchase for themselves or Post Office if they hope recipients will receive the card physically. 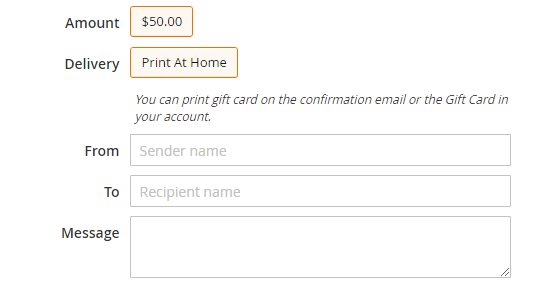 In case, customers choose to print their cards at home, they have to fill in their email address so that the system can process to send a email to buyers. Customers also go to their account, access My Gift Card, and print their cards directly from here. With regard to post office, senders are required to provide recipient address. With all outstanding features offered Mageplaza Gift Card extension is sure to satisfy even the most difficult customers. If you want to look for more detailed information about delivery methods applied, you can take a quick look here.